UNC Charlotte’s Devin Clegg sees a strong linkage between his selection for a prestigious National Science Foundation Graduate Research Fellowship and lessons he learned when conducting research and playing football with the Charlotte 49ers. Clegg, who completed his bachelor’s degree in exercise science at UNC Charlotte in 2016, is pursuing a master’s degree in biology at UNC Charlotte. With the fellowship, he will receive three years of financial support over a five-year fellowship period – a $34,000 annual stipend and $12,000 cost-of-education allowance to the graduate institution. Clegg is among 2,000 awardees chosen this year from over 13,000 applicants. Clegg is affiliated with two research labs in the Department of Biological Sciences in the College of Liberal Arts & Sciences – the labs of marine biologist Adam Reitzel and molecular and cell biologist Richard Chi. Clegg’s research combines molecular biology and protein biochemistry to uncover how genomes evolve in animals. Clegg first was exposed to molecular biology when Chi served a turn as the UNC Charlotte 49ers Football Faculty Coach. At a players’ meeting, Chi described his research and tossed out an offer to mentor players interested in the life sciences. 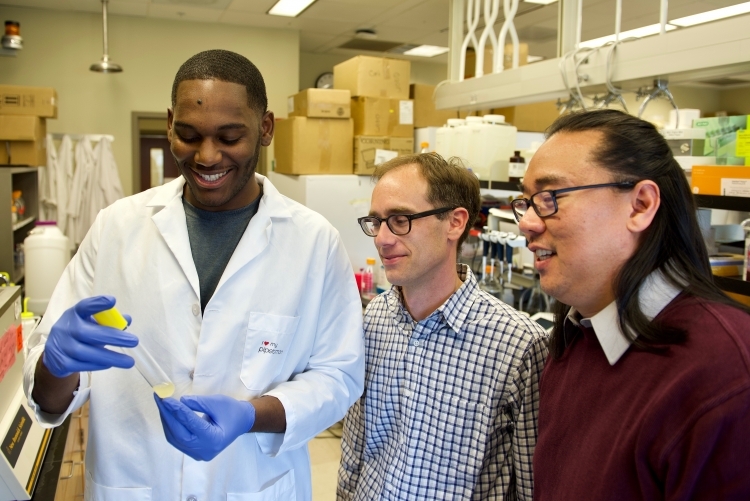 Through hard work and determination, Clegg obtained an internship with Chi’s lab, which employs molecular biology, protein chemistry, live cell imaging and yeast genetics to study proteins involved in membrane trafficking. "When I first met Devin and saw his determination and his desire to learn, I believed he would be a strong addition to the research team in my lab," Chi said. "He has proven that true in his time with us, as he has grown as a researcher. His research holds potential not only for him, but also for his particular field of study. I know, too, that he will continue to evolve as a scholar and also as a mentor for students who are coming behind him, which is important not only in my lab but also in modern research generally." The direction his research took led to him working also in the Reitzel lab, which employs evolution ecology, genetics, molecular biology, and field studies to answer questions about the evolution of proteins in marine invertebrates, such as sea anemones, jellyfishes and corals. Following graduation in 2016, he pursued a post baccalaureate to complete courses for a biology degree and to grow his research experience and obtain a better understanding of cellular and molecular biology. He already knows one important lesson he will share with others.